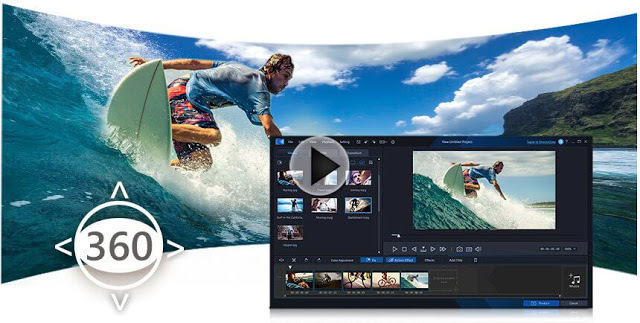 Cyberlink ActionDirector 2 is a video editor designed for action cameras, with 360 video editing capability. Normally it is $49.99 but for a limited time, it is available for FREE. :-O But please see the cautionary note below. To get ActionDirector 2 for free, go to this site. They won’t ask for your credit card number or anything. After submitting the form, you will receive a license key and you can download the file. I’m not familiar with this website so I can’t vouch for the safety of the software. Their installer file is definitely different from the installer file from Cyberlink. I downloaded the trial version directly from Cyberlink here and then I was planning to enter the license key from Sharewareonsale. Unfortunately, I could not find any option to enter the license key in Cyberlink’s trial version. So… I guess to get the ActionDirector2 for free you would have to install the version from Sharewareonsale. Do so at your own risk (there could be spyware or other malware). I’ve emailed Cyberlink to inquire if this is legit but it usually takes time (weeks) for them to respond. Perhaps you can download without running or installing the file until we know for sure that it’s ok.
UPDATE: Simon Miya of InFilm provided this helpful tip. Sharewareonsale has nagware. Here’s how to avoid it. Thank you very much to Borna Filic for sharing this info! You can check out his impressive Instagram feed here! It will be shown (and can be copied to clipboard) if the installer has a problem downloading the file. I wonder if it supports H.265 import like the version of ActionDirector that you get with the Gear 360? Good question! I don’t know yet.